The Kaleidoscope of Butterflies continues this month, and I've been stitching all weekend to get my next butterfly block done. I'm glad this link up came along! I've been feeling a paralyzing amount of angst about the fabric choices for this project. But, these stitched sections are all decided, so I can do them now, and worry about the rest later. And I have a feeling that once these are done, and I can put everything up on the wall together, it will be easy to see what's next. Or at least, easier. For more kaleidoscopes and butterflies, check out the Kaleidoscope of Butterflies link up, right here. No real life butterflies here either. 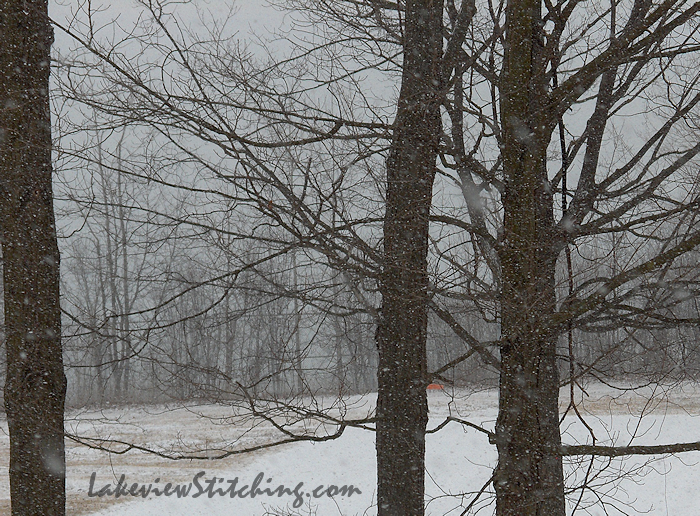 We had snow flurries this a.m. So yellow seems to be a good thing to work with to keep away the blues. Sweet butterflies! Perfect fabric choices if you ask me. Looks like some fun stitching too. This is such a delightful pattern. 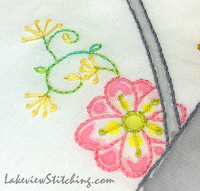 I love all your stitching and it looks like some parts are painted or inked. 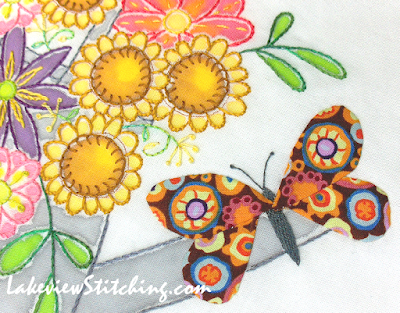 As Cathy said, you've chosen perfect fabric for your butterflies. I especially like the way you positioned the circles on the wings. Thanks for linking this grand project with Kaleidoscope of Butterflies. What will you have next month? Can't wait. So happy to see this project up again. 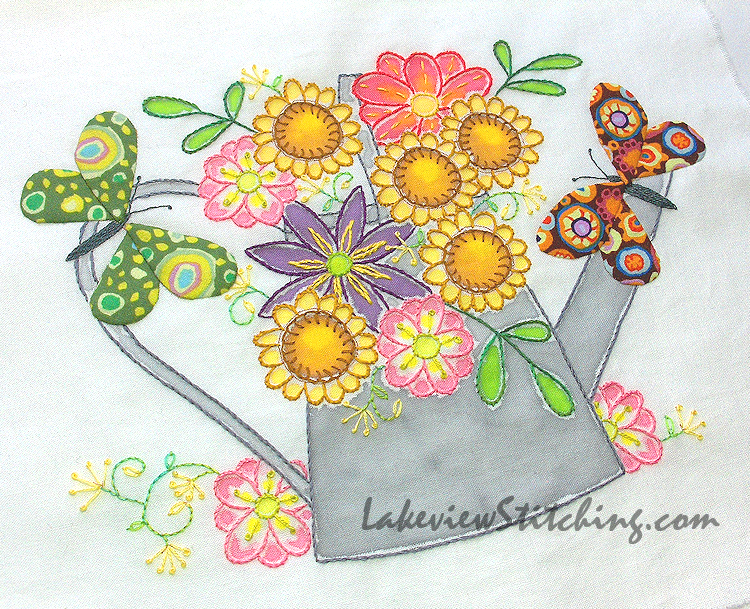 I think we all need the bright colours of spring right now. There may not be any real butterflies fluttering with the snowflakes, but the ones your just finished are marvelous. The colors work perfectly with the colors of the block. 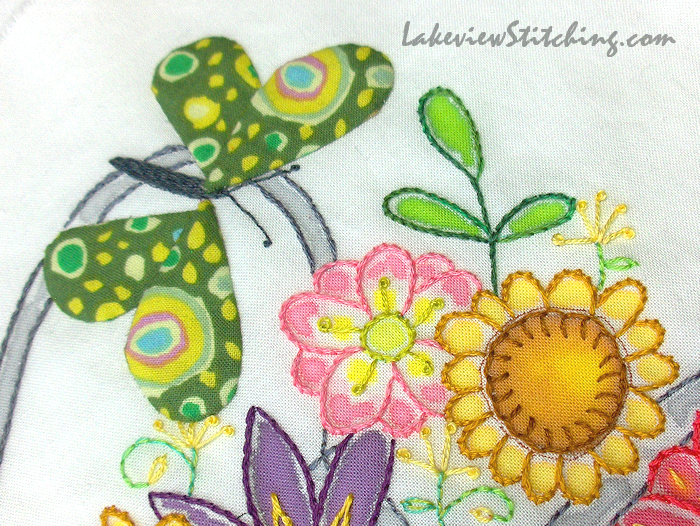 Lots of wonderful stitching and fussy cutting. I love flutterby's roll on spring. Yours are a lovely reminder it's not far away. Wow - that landscape couldn't contrast more greatly than with ours at the moment - another week over 34C! No wonder you are working on butterflies. I especially like the goody-blue one. Such a lovely bright block. Thanks, Jillian! Yes, I had a feeling my Australian friends would appreciate that photo. Last night we had even more snow, and with the sun today, it is pretty bright out there! What a joyful pretty block! It gives a taste of spring in the Canadian winter, which season I love more than spring! This looks great and I've just read your response to Ann - what a lot of work! But it is paying off. Layin'around on the couch and catching up on my blogs. It's gray, raining, and chilly here. Your bright butterflies are brightening up the day. It will be over so fast today as we set the clocks ahead last night. I always hate the day when we switch over although I will enjoy the longer daylight in the evenings.